Man, if you look at the website, you will note they really are keen on you finding this place and sampling the ONE thing that they pride themselves on having re-invented and perfected--BURGERS. The following was excerpted from both the menu and the website--yep, a local burger joint has a website, so you're just going to get all giddy with the anticipation of some impending awesomeness. "...From apps to nightcaps, you’ll find only the highest quality ingredients, like locally sourced Angus beef, ground fresh daily..."
Secure in the knowledge that this burger was going to be the culinary equivalent of the second coming of keerighst, I brought along three fellow conference attendees to sample the finest, freaking burger in the fair city of Denver. The Wind Up...............The service was spotty. The AC was doing a poor job. The booth seats were wet from the recent wipe down. There were pieces of food on my fork. The waitress actually told us that she forgot about us midway through the meal. All these things were service related and, therefore, of no consequence since an amazing burger was sure as hell going to overshadow all of these trifles. There was just no way that they could have been full of crap, right? The Pitch..................The burger arrived with a marvelous, griddled sear, but it came out an overcooked Medium--I ordered Med-Rare...Strike One. The meat was juicy, and it was properly aged to deliver a nice front note of the good stuff. Quality beef--maybe they were on to something. The massive bun was toasted--but in a mild, lackluster way that provided no shift in texture or flavor, but they sort of tried. Did I mention that the bun was massive? The bun was massive, so the meat to bun ratio was all wrong. Strike Two. The meat was freshly ground and formed ever so gently so that all of those sticky proteins in the medium grind minded their own damn business and did not form a rubbery mess....good for HBurger. 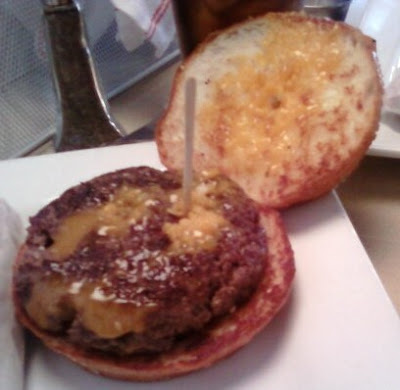 Looking back--I suppose HBurger's menu and/or website never touted any modicum of competence in terms of preparation. They merely stated that they had good ingredients, and that those ingredients would find their way into your food hole. This burger would have been good if a little care were taken, and the chef and management took the time to run both the front and the back of the house. That said--screw 'em for turning out a mediocre product. Burger Review -- The H in Hburger stands for HALF-ASSED and/or HYPE. It was a lousy value and a bad experience. Rating...1 Bite. It would have been 2 bites on the merit of the ingredients, but the quality of the preparation dragged this into the basement. wow...I like the burgers. I'm no connoisseur but I don't feel dirty after I eat them. As a former chef, thoughtful consumer, and lover of quality ingredients prepared with skill and care, I take great umbrage when purveyors of that very simple and classic dish (cheeseburger) fail to deliver a quality product, particularly when they charge a premium for that product. Thanks for reading the reviews, Mark. If you are looking for a stellar burger, you might check out the burger at the restaurant in the St. Julien hotel in Boulder--it's a bit of a trek, but it was great when I went there a few years ago.